Ipmuda Tiles and Sanitarywares (ITS) is the IPMUDA Groups specialist division for Sanitarywares, Faucets, Bathroom Accessories and Wall & Floor Tile finishes. 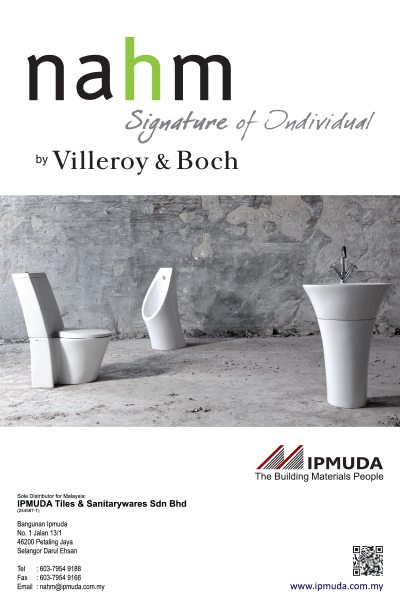 ITS is the sole distributor of Villeroy & Boch Group’s nahm brand of sanitarywares in Malaysia. Manufactured in Saraburi, Thailand to the exacting standards of Villeroy & Boch, it shares the same 265+ years of ceramic experience, V&B’s renowned glazing and other production facilities. A mix of tradition, expertise and trendsetting designs from creative Thai designers such as Ou Baholyodhin, Eakrit Pradistsuwana and Euwarote Srisudh, nahm is found in fashionable spas, nightclubs, resorts, hotels, showrooms, condominiums and commercial complexes. ITS also the sole distributor for Ottone Meloda faucets and GEESA bathroom accessories in Malaysia. Ottone Meloda is one of the few Italian products that are still 100% made in Italy in their own fully integrated production facilities in San Maurizio D’Opaglio, Novara. It is one of only 20 Italian tap & valve manufacturing companies to be awarded the Q AVR mark. Relying on notable designers such as Massimo Giorcelli, AF Design Lab and their very own Ottone Meloda Design Studio, it brings fresh and modern European designs to exclusive homes and commercial buildings all over the world. GEESA is an established brand, fully made in the Netherlands by experts who have had to contend with living next to the corrosive sea air. Its products are found in leading world class hotels such as the Radisson Blu, Intercontinental, Holiday Inn and even in cruise ships. More than half of the top 10 largest cruise ships in the world are using its accessories and its ability to provide a 12 year warranty on its 12 micron chrome plating is another testament to the confidence they have on its chroming technology. GEESA also boasts of exclusive ranges penned by famous designers such as Marcel Wanders and Robert Bronwasser. ITS also has its own range of project friendly range of Ortolani faucets and bathroom accessories and Concorde stainless steel sinks.